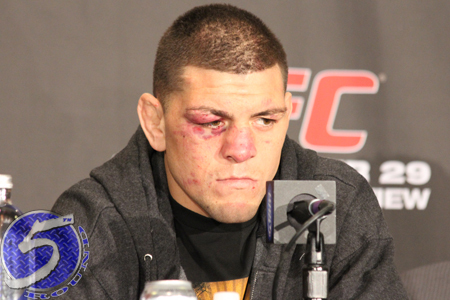 With his UFC interim welterweight title scrap against Carlos Condit less than a month away, Nick Diaz (Pictured) had no time to address BJ Penn’s unexpected insults from Thursday. However, that didn’t prevent Team Cesar Gracie from responding on their client’s behalf. “BJ Penn has apparently not come to terms with the beating he received at the hands of Nick Diaz,” read the statement on GracieFighter.com. “At some point it is up to those around you to protect you from yourself. To take you aside and let you know you are wrong and help save you from your folly. Diaz hung a lopsided unanimous decision win over Penn this past October, which prompted the Hawaiian to contemplate retirement. After going dark for several weeks, Penn reemerged on Twitter yesterday and questioned the “coward fence holding strategy” Diaz executed in their UFC 137 shootout. Immediately after Penn posted his message, some thought his verified account had been hacked. However, fast-forward 24 hours and the tweet remains visible for the entire Twitter universe to see. Furthermore, 12 news articles have since been published on @bjpenndotcom, including CesarGracie.com’s response.